Can a mother lose custody of her child? If so, how does it happen? The reason you are asking this question is because you may still believe this is a "bias" of some sort in favor of mothers. Otherwise, it would not be a question of whether a "mother" can lose custody of her child, but whether any custodial parent (mom or dad) can do so. We understand your perspective. If you are the non-custodial parent and the custodial parent is the mother, you may think you have a tough road to travel. Here is the good news. You do not. Certain misconduct by any parent may cause that parent to lose custody of her or his child. However, since we are on the subject of a mother losing custody, we will stick to that theme. There are two things you have to know. This article is about a mother’s serious misconduct that should cause her to lose custody. It is not about how a father should engage in unnecessary or unreasonable litigation conduct. This is also for fathers who have the courage to litigate the child custody case. A goal without a plan is a wish. If you "wish" to make changes but will not follow through to do it, you are wasting your time reading this article. If you have the ability and courage to expose the mother’s misconduct in family court and make positive changes in your child's life, you are in the right place. What are the top 5 reasons a mother can lose custody of her child? Click on each link below to jump forward to that section of this article. Mother’s physical abuse of a child or father. Mother’s emotional abuse of a child, including parental alienation. Mother’s neglect of a child. Mother’s frustration of a father’s parenting time. Mother’s violation of a court order. How does a mother’s physical abuse cause her to lose custody of a child? Physical abuse is proper grounds for a mother to lose custody of the child. If you as the father allow physical abuse to continue and do not take action, you may be committing child neglect. You have a duty to protect your child. There is no time to waste. There is no better time than now to remove a child from a physically abusive situation. A mother loses custody of the child because of physical abuse of the child in any of the following ways. A report to social services, sometimes called child protective services, who then opens a case and investigates the allegations. Child protective services has the power to remove a child from a physically abusive home and temporarily provide custody to the non-abusing parent or even other family members. That may then lead to a “Dependency” court action. A Family Court action where the father files a request for order with the court. This request for order tells the court about the mother’s abuse. It usually asks the court to award the father sole legal and sole physical custody with professionally monitored visitation to the mother. Keep in mind there are mandatory reporters in California. These mandatory reporters have a legal duty to report suspected abuse. If you know or reasonably should know the mother is abusing your child, still do nothing and the first report is by a mandatory reporter, that may reflect very poorly on you. 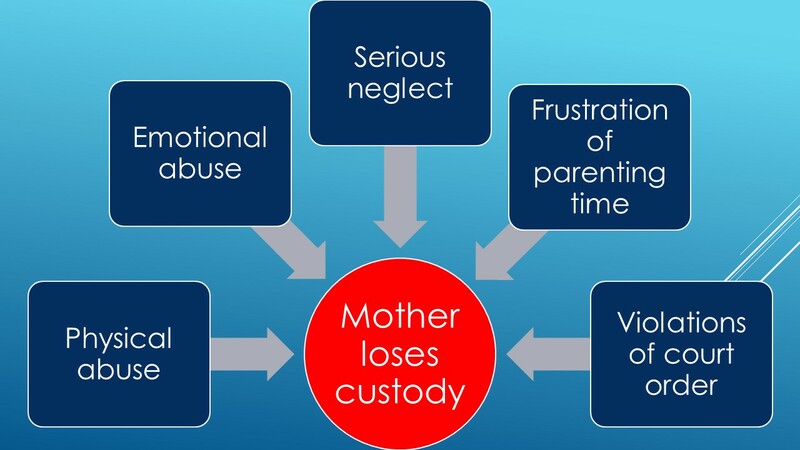 A mother loses custody of the child because of physical abuse of the father in the following ways. The mother’s arrest by law enforcement because of a domestic violence incident: This typically leads to the father receiving an emergency protective order from the police and a possible criminal protective order from the criminal law judge. The criminal protective order occurs if the district attorney or city attorney prosecutes the mother. The father’s domestic violence restraining order petition in Family Court, where the father requests sole legal and sole physical custody and likely supervised visitation for the mother. Can a mother’s emotional abuse really cause her to lose custody of a child? Emotional abuse comes in different forms. Here are the most common. A mother’s verbal abuse towards child: This is usually badgering, disparaging or belittling the child through yelling at him or her for unjustified reasons. A mother’s parental alienation of the father: Parental alienation takes many forms and we provide you with two links below that go deeply into this topic. Withholding love or emotional support from the child: This may be the most difficult to prove. Physical or emotional abuse of the father or sibling: No child should witness abuse. If a mother exposes a child to physical abuse of the father or the child’s sibling, that is proper grounds for the mother to lose custody of the child. How serious does neglect have to be for a mother to lose custody? Serious neglect is proper grounds for a mother to lose custody. There is no “perfect parent” standard in the California Family Code. Family law judges understand parenting is an imperfect process. Parents will make mistakes. There is a difference between a mistake and a consistent poor exercise of judgment. A mother’s serious neglect that endangers the health, safety, education or general welfare of the child should cause the mother to lose custody of her child. What is frustration of parenting time and how can it lead to a mother losing custody? Frustration of parenting time does not have a specific definition in the California Family Code. However, we have a specific definition for it. We call frustration of parenting time (1) consistently and (2) unreasonably limiting or interfering with the other parent’s parenting time. A mother who consistently and unreasonably frustrates a father’s parenting time should lose custody. We provide three reasons for this conclusion. A mother who frustrates a father’s parenting time is usually also capable of engaging in worse conduct, such as parental alienation. We commonly see frustration of parenting time that goes unpunished eventually lead to active alienation. Can a mother’s violation of a court order cause her to lose custody of a child? Violations of court order are like any other form of misconduct. The more serious the violation is, the more serious the consequences should be. Assume a mother is consistently late to drop off or pick up of a child by a few minutes. That may technically be a violation of a court order. That rarely, if ever, will result in any change in custody. Now assume a mother decides the court’s order that provides the father with specific parenting time is a suggestion, not a directive. Therefore, she cancels the father’s parenting time when she wishes to do so. That is a serious violation and if, it continues, that should lead to a mother losing custody of a child. What are the steps to take custody of a child away from the mother? The father’s steps to take custody away from the mother depends on whether the father already has a child custody order. If the father is married to the mother and neither has filed for divorce, the father has to decide whether the situation is serious enough to proceed with a dissolution of marriage or legal separation petition. There is a procedure available to seek child custody orders without seeking dissolution or legal separation. Married parents rarely take that approach. If the parenting situation has become that strained, the chances are good the marriage is over. Fathers in this situation should do the following. Document the mother’s misconduct and make reasonable efforts to reach a resolution that stops the misconduct. The documentation can be through electronic or even written communication with the mother. If the mother’s misconduct does not stop, the father should consult with a family law attorney to discuss his options. If the father proceeds with a dissolution, legal separation or child custody petition, he should file a request for order that asks the court for appropriate custody and parenting time. The answer for unmarried parents is almost identical except they do not seek a dissolution or legal separation petition. The father instead files a parentage petition. After the father files a parentage petition, he serves the petition through the appropriate means on the mother. The father should also file and serve a request for order that seeks appropriate child custody and parenting time. Fathers have several options available to them. The father may communicate with the mother, document the violation and attempt to resolve it without court intervention. The father can file a contempt order to show cause against the mother if her conduct violated the court order. The father may decide to file a request for order and ask the court for a modification of child custody or parenting time. The more serious the violation, the more likely the father should seek sole physical custody and perhaps even sole legal custody of the child. Is your custody order a temporary order? Each of the above three options applies if the father has a temporary order. With the temporary order, the father needs only to show that a modification of the current custody order is in the child’s best interest. Is your custody order from a judgment? The above three options also apply if the father’s custody order comes from a final judgment. However, if the father wants to modify legal custody or change parenting time to a significant degree, he usually needs to show a significant change of circumstances before showing why the modification is in the child’s best interest. The father should not struggle to make this showing if the mother’s misconduct is serious enough to cause her to lose custody of her child. Fathers who are serious about parenting and who deal with very unreasonable mothers who engage in willful or reckless misconduct should not hesitate to seek court intervention. Your child is worth your time and effort. To allow your child to be in an unsafe or unhealthy environment can have a lasting, negative impact on his or her life.